Special: Triple Flamin' 7's Logo is wild. One logo in a winning combination produces a 3x payout, 2 logos in a winning combination produces a 9x payout. 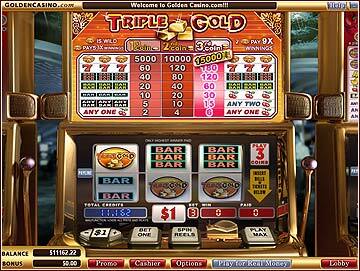 Note: a single, double or triple logo on the payline outside a winning combination does not produce a multiplier as they have their own payout. Special: Triple Gold Logo is wild. One logo in a winning combination produces a 3x payout, 2 logos in a winning combination produces a 9x payout. Special: Triple Rainbow 7's Logo is wild. 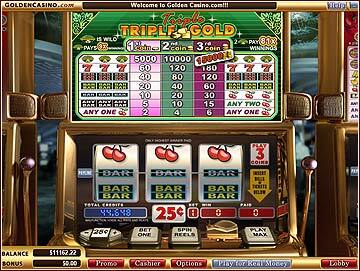 A Logo on the payline in a winning combination pays 3x Winnings. 2 logos on the payline in a winning combination pays 9x winnings. Note: A single, double or triple logos on the payline outside a winning combination does not produce a multiplier effect as they have their own payout. Special: Triple Triple Gold logo is wild. One Logo in a winning combination pays 9x the winnings. 2 logos in a winning combination pays 81x the winnings. Once under the control of mechanical workings then electronics the 3 reel slots machine like all other slot machines is under the control of the computer. While some long for the days of mechanical slot machines for a more 'fair' type of play, the computer has revolutionized the slot machine industry. 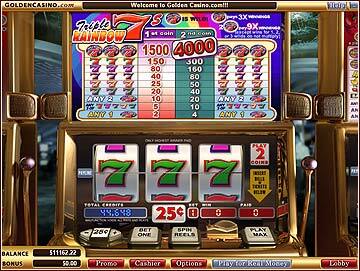 Fair play is not a problem as it is nearly impossible to tamper with the slot machines programming. 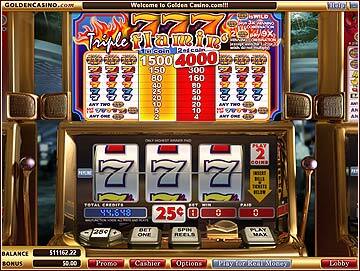 3 reel slot machines have also ventured online and can be found by the hundreds in online casinos. Like their offline bretheren the online 3 reel slot machines are controlled by computers, offer the same great experience and even better payouts.